Here is a simple tutorial that tells you how to disable switching between running applications in Windows 8. Although, switching between Metro apps in Windows 8 is very beneficial as it allows you to turn onto another application instantly. All you do is just move your system’s mouse to the top left corner of your Windows 8 screen. However, in case you do not like this feature and want to remove such switching, then let me tell you…you can do it in just a couple of minutes. Press “Windows Key+I” to let the slide bar appears. Now, click on “Change PC Settings” given at the bottom of the slide bar. This will quickly open “PC Settings”. Just head over to the “General” option. Now, look at the right side, you will find “App Switching” section. App switching is enabled by default, however, you can change it according to you preference. 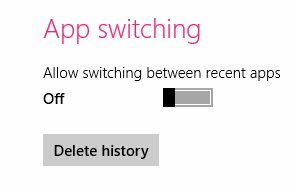 In order to disable switching between running applications in Windows 8, just click over the slider given under the section “App Switching”. Yupp…you are done. Now just move the mouse at the top left corner to check if the switching between the running applications has been disabled. Go ahead and follow the above given instructions to disable switching between running applications in Windows 8.